I mean really, wonder if we looked at prayer like that, a battle against the enemy, that every time we prayed the enemy grew a little weaker. Our words like swords, stabbing a hole in his evil plans. Well, I have news for you…our prayers are like weapons against the enemy’s evil schemes. Each time you utter a word of praise and thanksgiving, even in the middle of your storm, you are weakening the lies in your heart and mind and Jesus is setting you free. Then it goes on and says in 18:Pray in the Spirit at all times and on every occasion. Stay alert and be persistent in your prayers for all believers everywhere. So the sword is the Spirit and we are to pray in the Spirit at all times and stay alert and persistent. Hmmm….sounds like battle to me. I love when someone says something they never intended to be super spiritual but God reveals a truth in those words. What a fun read! I was immediately drawn into this book. You know you have a good book in your hands when you feel like you are getting acquainted with new friends. This book played out like a movie in my head. With Abigail’s insecurities and her wounds from the past to Jacob’s desire to provide for his daughter. But honestly, I think it was the Valentine Volunteers that stole the show for me. What a great group of ladies I would love to hang out with. This book truly has it all, laughter, romance, just the right amount of tension and misunderstandings, even the mystery of the paper hearts Abigail is finding. I seem to be especially drawn to books that take place in a bookstore, I just love the cozy feeling it gives me. If you are looking for a good contemporary romance look no further than Paper Hearts. Today we get write to the point with Cari Schaeffer. Read on to learn more about her and her amazing testimony. I was born to a hippy in California and grew up all over the Southwestern United States. In fact, I wrote my mother’s address in pencil for years because I knew it would change frequently. I am currently married (will be celebrating 25 years in March) and have three children. I have been writing for about three years now and plan to write as long as God gives me stories to tell. I came to know Him in church as a child. I heard the Gospel message every Sunday and one day, when I was about 5 years old, I just felt it was for me. I answered when the Pastor gave the altar call. My first novel was published almost a year ago. 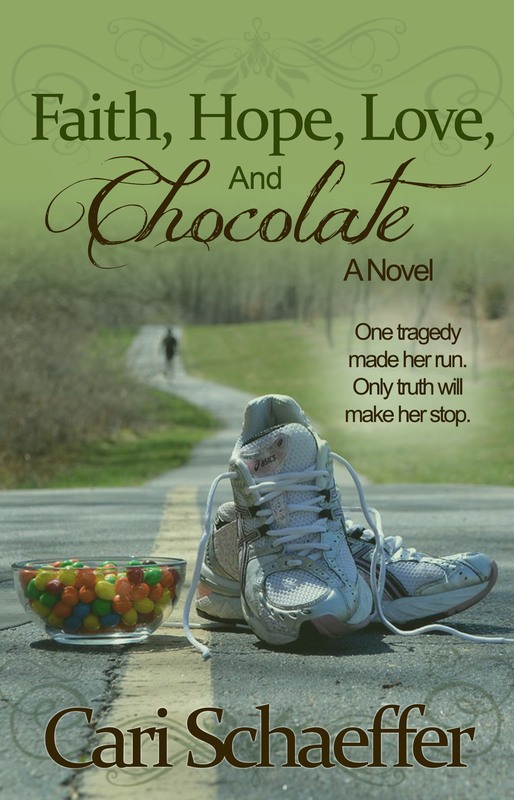 It is titled “Faith, Hope, Love, and Chocolate”. What I want readers to take away after the last page is a deeper understanding of who God is, rather that who we believe Him to be. I also want women in particular to see themselves through His eyes rather than through the lens of life. Every single woman I have ever met carries deep wounds, warped parts of themselves and tries very hard to hide it. They hide it from friends, family, spouses, and children. They even try to hide it from themselves. It doesn’t work. The warped sense of self permeates every aspect of life. I want them to see God knows and loves them and has a plan for their lives. I don’t blog nearly as often as potentially I should. My blog is Conversations with Cari and I try to cover areas of interest that women care about. I cover fitness, food, finances, and overall well being. “Angry Housewives Eating Bon Bons”. It is not a Christian fiction, but it is just a good read. It’s about a group of women on Freesia Court that start a book club. It lasts for decades, as does their friendships. They all come from different backgrounds and have amazing challenges to overcome. It’s their friendships that endure and carry them through life’s challenges. Wow. Where do I start? As I said earlier, I was born to a hippy. Here’s the elongated story – I was born to a nineteen year old run away and I have an older sister. My father was ten years older than my mother and a criminal. Some of his closest friends were pictures my mother would see on the FBI’s Ten Most Wanted list back then. In fact, my mother was the unwitting driver of a get away vehicle once when my father robbed a convenience store. My father left before my first birthday and we never heard from him again, except to find out in the early eighties that he had been killed a few years earlier. As a single mother, my mom struggled to raise us and often made unwise choices in relationships. I knew the smell of marijuana by the time I was six. I could very easily have been harmed in so many ways growing up, but I was not. God protected me and my sister in the midst of some pretty horrible situations. As I mentioned earlier, I heard the Gospel in church every Sunday thanks to the bus ministries that existed then. My mother would go to church about as often as she didn’t. But she always made sure my sister and I went. My grandparents prayed fervently for us and hounded her about it, thankfully. As I grew up, I knew the life my mother had was not the life I wanted for myself. When I graduated high school, I determined that my life would be different. I joined the Air Force because I wanted to contribute to society rather than be on welfare, and I wanted to go to college. The GI Bill would (and did) allow me to do that. I launched my life higher, better, and more than it could have been otherwise. God guided me in the decisions I made and still does. I am so very thankful for Him. I literally owe him my life. This verse is the foundation of my life. It let me know early on that God saw and He knew. He knew I was better than where I was or where I had come from. My earthly father rejected me, but my Heavenly Father made me and saw me as priceless. That is what and who I am. Mostly on Facebook under Cari Schaeffer. I also have a website www.carischaeffer.com . I just hope that anyone who reads this will realize the truth about themselves and about God. Don’t let this world warp you into something or someone you were never meant to be. He is always there and He knows you. He loves you. Thanks so much for sharing with my readers. I pray God will continue to bless your writing journey. Patience definitely doesn’t start out overly patient, she starts with a spark, which I think is fun for a character with that name. There are a lot of little mysteries and things that you know will be connected sooner or later that will make you say “What will happen when this comes to light?” There are also a lot of things in this book to give a bit of a twist and add tension. However, I will say the tension seemed to ease quickly for me. I would get that nudge of anxiousness and then it would fade as the story moved on. I liked the storyline and the characters and secondary characters where interesting as well and helped depth. In saying that though, I didn’t feel a real connection to the characters. Instead of being drawn into the story I felt like I was watching from the sidelines and didn’t become overly invested. But, this is a good plot and I enjoyed the boomtown feel of the story. Grab you copy at your local bookstore, Amazon, Barnes and Noble, Christianbook.com or Books-A-Million. This book opens with a scene that will have you hooked and not let go. One thing after another happens to Sarah and I definitely felt her sorrow. The unsettled feelings from the past haunt Sarah and she needs closure even if she is in a bit of denial over it. But I kept worrying about her getting into trouble, about her saying something to the wrong person. And that is right where the author wants us, so invested that we are worried about the characters. The crimes in this book are pretty disturbing and so sad but for me that drew me even further into this book. I read Nancy’s first book in this series and loved it, this second book did not disappoint. This book can be read as a stand-alone. There is mention of characters in the first book but it is not a contributing factor to this book. Overall, a wonderful read that I couldn’t put down. Highly recommended for anyone who loves a good murder mystery. Today we get write to the point with Kathy Ide. Read on to learn more about her. I was born and raised in the Midwest, but moved to Southern California shortly after my first child was born. I raised two sons here, and they both moved out of state when they became adults. But SoCal is definitely my home now. And I’m loving my empty nest! That conference opened up a whole new world to me. I learned that the names on the books I had at home represented real people, normal folks who weren’t all that different from me. They sat on the grass and ate hot dogs and potato chips, just like the rest of us! I was working as an administrative assistant and graphic designer at the time. But before work, during lunch, after work, and on occasional weekends, I wrote magazine articles, play scripts, devotionals, short stories, and Sunday school curriculum, and actually got several items published. I attended other writers’ conferences and joined a critique group. I just knew, someday, I would have a novel published. Whenever I went to bookstores, I gazed at where my spot on the shelf would be—right between Angela Hunt and Jerry Jenkins! When I got tendonitis in both thumbs and both wrists, I was told I had to find a job that didn’t require using a computer keyboard or any other type of repetitive motion. Not an easy task! I got a professional-edition voice-recognition software program. But I couldn’t find an office job that would allow me to sit around and talk to my computer all day. After a few months of wondering what God had in mind for me, my husband asked me what I would do for a living if I could do anything. “Write!” I answered without a moment’s hesitation. “But I can’t make a living at it … not yet, anyway.” He asked what my second choice would be. I told him I enjoyed helping the people in my critique group improve their writing. He suggested I see if I could build that into a career. So I did. I now work at home full time, editing and critiquing manuscripts, and writing my own books as well. And I have never been happier! Still don’t have a novel on the bookshelf between Hunt and Jenkins. But I’ve found that I actually enjoy editing even more than writing. So that’s just fine with me! When I was sixteen, I spent the summer babysitting for a Christian family. Their well-behaved kids constantly surprised me. After they went to bed one night, I listened to one of the parents’ records. I heard “The Chaplain of Bourbon Street” talk about having a personal relationship with God through Jesus. When I got home that night, I accepted Christ as my Savior. Proofreading Secrets of Best-Selling Authors came out in January 2014. It gives aspiring writers, established authors, proofreaders, editors, and publishers a quick-reference tool to proofread manuscripts to minimize typos, inconsistencies, and errors in punctuation, usage, grammar, and spelling. This book is the first in a series of Secrets of Best-Selling Authors books. This summer, the first book in my new Fiction-Lover’s Devotionals series comes out. 21 Days of Grace: Stories that Celebrate God’s Unconditional Love is a compilation of short fiction stories followed by brief Life Applications that encourage readers to consider how each story applies to their lives. Every chapter is written by a different author. The first book’s contributors include such amazing authors as Angela Hunt, Deborah Raney, and Cecil Murphey. Book 2, 21 Days of Christmas: Stories that Celebrate God’s Greatest Gift, comes out in October. Book 3, 21 Days of Love: Stories that Celebrate Treasured Relationships, will come out next Valentine’s Day. Book 4, 21 Days of Joy: Stories that Celebrate Motherhood, will release in time for Mother’s Day 2016. Readers who love novels will enjoy having short stories with Life Applications to read during their quiet times with the Lord. They may buy the book because they recognize some of the well-known best-selling authors in it, but they’ll discover new authors as well. After reading snippets of their writing, they can get other books written by those authors. In addition to being very inspirational for readers, it’s a terrific cross-promotional tool for the contributing authors. I blog once a week (every Monday) with tips, helps, info, and encouragement for writers, editors, and other professionals in the publishing industry. Well, the Bible, of course. I’ve read it from cover to cover several times, but I still read from it every morning. The Holy Spirit always reveals amazing insights that fit situations I’m going through at the time. Aside from that … I loved Francine Rivers’s Redeeming Love. When I neared the last few pages, I read as slowly as I could to savor the experience. When I’d read the last line, I held the book to my chest and sighed in total contentment. But then I nearly threw it across the room because I was so upset that my experience with those characters was over! I have had several of those experiences! One example is when I got tendonitis and lost my day job. When the physical therapist told me I had to stop typing in order to heal, I thought that would be the end of my writing journey. But instead, I learned how to do it without affecting my tendons. And God used that “loss” to get me into editing Christian manuscripts, speaking at Christian writers’ conferences, in addition to writing Christian books. I love what I do so much, I’m extremely grateful for that tendonitis experience! I love Ephesians 3:20-21, which says that God can do exceedingly abundantly beyond all we could ask or think or dream or imagine (depending on which version you’re reading). Being a writer, I have a pretty big imagination! It’s awesome to know that God is way bigger than anything I could come up with. I am currently accepting submissions for my Fiction-Lover’s Devotionals series. Guidelines, details, and deadlines are on my website, www.KathyIde.com, under the Devo tab. Anyone who can write a really good fictional short story is welcome to send something! Thanks so much for sharing with my readers. We love hearing about writers journeys and how God has worked in their lives. I always enjoy Rachel’s books because she has so much depth to them. If you look beyond the words that are written you will find a gospel message. Ginger struggles with her scars. She believes she must cover them up so no one else can see them and if people do see them they will reject her. She believes she could never be beautiful, that a happy-ever-after will never happen for her. But Tom sees the truth. He sees beyond her scars into her heart and knows she is beautiful. Isn’t this message so true of many of us? We hide our scars, our past, or we cling to them and allow them to define us, instead of using our scars for His glory. Remember Thomas didn’t believe it was Jesus until he saw the scars. Many people won’t see Jesus until we start sharing our scars with others. Anyway, that is the underlying message I got out of the super quick read. If you are looking for a fast little romance I recommend this one. Grab your copy at Amazon, Barnes and Noble, Christianbook.com, Books-A-Million or your favorite retailer.